Celebrate Hanukkah with 3G @ LAMOTH by making challah and chanukiot with Holocaust Survivors!! L’Dough V’Dough: Light and Miracles is a program of Los Angeles Museum of Holocaust (LAMOTH) that celebrates the Jewish traditions of Hanukkah, and connects young adults with Holocaust Survivors for intergenerational dialogue, exploration of personal narratives, and learning about Jewish life before, during, and after the Shoah. Evoking the Hebrew phrase, “L’Dor V’Dor,” or “from generation to generation,” L’Dough V’Dough brings people together to share, remember, and bond one generation to the next in an environment conducive to asking questions and encouraging dialogue. 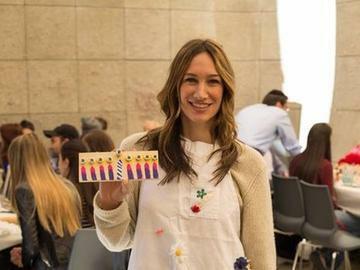 This experience is part of the Infinite Light citywide festival, which is made possible by a partnership with NuRoots, an initiative of The Jewish Federation of Greater Los Angeles. 3G at LAMOTH is a community for grandchildren of Survivors who are helping to shape the future of Holocaust remembrance and education. Our mission is based on memory, education, community, and social action, drawing on our own personal connections as stewards of our grandparents' legacies and the rich resources and support of LAMOTH. Our 3G @ LAMOTH group is committed to carrying on our grandparents' stories and legacies which live in our personal histories and in our DNA. It is our responsibility to remember, it is our responsibility to educate, and it is our responsibility to inspire. As a 3G group, we stand for commemorating our past, changing the future, and creating a world of mutual respect. We teach how hate, discrimination, and prejudices lead to one of the worst chapters in human history. The Holocaust was a Jewish tragedy, but also a tragedy for all of humanity. What we do matters, and education helps us to close the gaps that divide us. Los Angeles Museum of the Holocaust (LAMOTH) is an artifact-rich institution that was founded in 1961 by Holocaust Survivors who met in Los Angeles, each with their own personal experience and precious documents, photographs, and objects that connected them with their history, family, and friends. They believed in the importance of creating a space to commemorate their loved ones, house their precious artifacts, and educate future generations. Today, Los Angeles Museum of the Holocaust continues its mission to commemorate, educate, and inspire.